Free-to-play shooters are nothing new. Neither are MOBAs. But a combination of the two? That’s crazy talk! Hero Mode in Aeria Games’ upcoming Soldier Front 2 will pit two teams of five players against each other in classic MOBA fashion, sent to destroy the enemy’s – er, “object.” That’s what they call it on the website, but I’m sure they’ll come up with a cooler name, like “Subspacial Dimensional Rift.” Or maybe it’s a “Legendary Taco Stand.” Don’t come between elite soldiers and their tacos! In addition to other players, you’ll have to deal with wave after wave of alien minions, known as Xanthids, described as “extraterrestrial creatures that escaped from an Andromeda prison colony.” With a background like that, you know they’ll be hungry for blood (and maybe tacos). Other Xanthid-related missions include a co-op Defense mode, which tasks four players with mass alien extermination, and a PvP mode that casts one team in the role of the Xanthids, who can choose from a stealth-based melee class, a fast bomber class, or a ranged-projectile class. 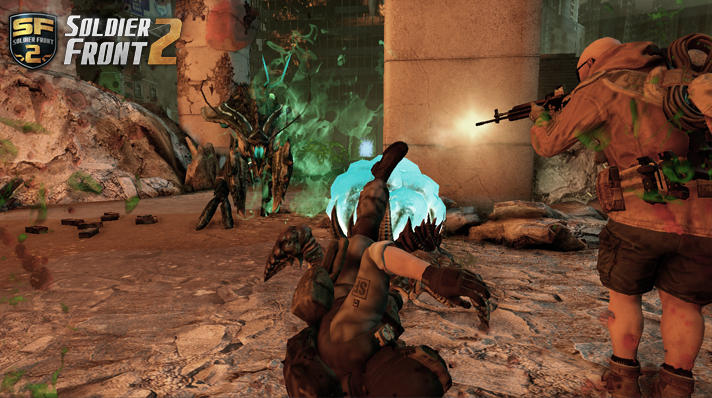 Soldier Front 2 also offers standard PvP missions, such as deathmatch, bombing run, and capture the taco – er, point. Capture the point. Aeria Games is currently taking beta signups on the game’s site. It’s interesting to see the MOBA genre be expanded to something beyond the typical top-down view and with FPS mechanics (sorry, Smite). With as many MOBAs as there are out there – with more to come, a topic we discussed in last week’s F2P Cast – developers will have to come up with new ideas to get people into their games. Are you interested in checking out Soldier Front 2? And what do you think would be a neat new direction for MOBAs to take? Leave a comment below and let us know! whats next MOBA with football/soccer games?! I can see this working well but it all comes down to pacing, if the game is too slow paced I won’t touch it. The reason I don’t get invested in mobas is the amount of time most of them take per match and I can’t see myself spending that amount of time in a match on any shooter, even battlefield and planetside. I don’t dislike them but I start to lose my edge after a while and I start becoming nothing more than a target. I prefer short bouts with shooters. Also they would need to make the stats tied to the moba mode separate to even the playing field I would imagine or people would do other modes to max themselves out then jump in to the moba game so I have to question how they are planning to integrate it. Soldier front was one of the greatest games, I hope they didn’t start making part 2 from scrap. MOBA combined with FPS-ITS WILL BE EPIC GAME! Not the biggest fan of either, but I’ll definitely be giving this game a try. Not interested. I never liked the level development of Soldier Front. Sad mmobomb is now “your comment is awaiting moderation”. Looks like more control now that the crew is gone and image for slow, late, and poor coverage damage control. pssstt notice less people visit and or comment now? I suggest letting free speech stay. Always moderated when trying to post a link XD sad. Its not moderated at all. If you tried to post a link that may be why. I am not sure we allow unverified links to be posted before we take a look at them to make sure they are not spam or dangerous (viruses etc). Free speech is always welcomed and encouraged. Did you know that this game havn’t been in the western market before? Or you probably already know, but ou think this one already dead in the eastern market. Besides, A.V.A is still there, and it doesn’t shows any signs of dying. Play the game first, then talk sh*t about it. fail game but still a good game. good and fail doesn’t always mix and you didn’t even see something about it …. Screenshotting through walls and crates to snipe players half the map away (unless a hacker insta-killed my team) were major selling points to me. I’m just not sure that SF2 has quite met the expecations of a triple A title like its predecessor had. To be fair the author didn’t say they hadn’t been made before. And also, SMNC was more like a traditional MOBA. It wasn’t a Shooter like, with standard guns and grenades, it was an Arcade-style MOBA with Shooting Mechanics and Gameplay Mechanics similar to SMITE. I’m actually interested in a Traditional Shooter set in a MOBA-style lane-based game. The original Monday Night Combat was so much better than SMNC.